Google Maps Apps targeting Android Pie are broken ? Create a new Android project targeting Android Pie, updated the support design library (Xamarin.Android.Support.Design) to 28.0.0.1 because by default the template seems to set the target at 8.1. I then added the the nuget package "Xamarin.GooglePlayServices.Maps". Which generated a warning about a dependencie not beign updated (Xamarin.Android.Support.Media.Compat) and still at 26.0.2. So I manually update it at 28.0.0.1. Compile the app. The app deployed ok, started, but when the map is about to be shown, I got this error. So kinda back at square one! 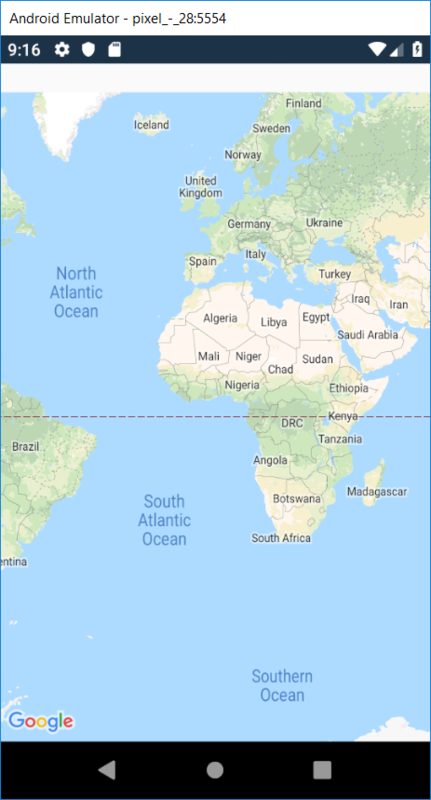 So whay should be the proper way to build an app targeting Android Pie that uses Google Maps in a fragment ? I'm lost here! Anyone can share an explanation that may be usefull to all ? For what it's worth, the workaround works for me. The <uses-library ... /> tag is the last one on my <application /> tag. Can't we update play-services-maps somehow? I can't even find out what version Xamarin.GooglePlayServices.Maps includes for you.. I have implemented the change. Now I get an error that for google maps to work, I must provide the fine_location and course_location permission. The problem is that I do. Here is the content of my AndroidManifest.xml below. I always assume the problem is with me. Does anything look out of whack? I'm just not sure what I am missing. My android OnCreate is shown below. ugh, I hate it when I ask a question, then realize what I was doing wrong. I refer to this as poster's remorse. I'm good now. Try not to laugh too much.